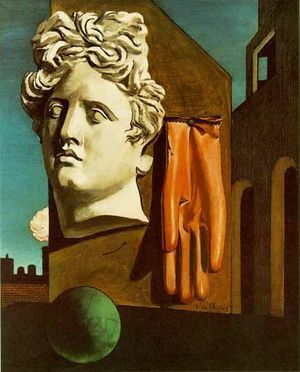 Preface: A friend who is taking a sculpture class told me that she's going to do a sculpture on Apollo based on Song of Love, a 1914 painting by Giorgio de Chirico. Yes, this was a landmark painting ushering in the art of surrealism ten years before the movement was founded by André Breton in 1924. De Chirico is also one of my favorite painters whose surrealistic themes inspired much poetic and philosophic ponderings. The giant Greek sculpted head in the painting certainly looked Apollonian. Certainly my friend could use this fine painting as a model for her sculpture on Apollo. But after hearing what Robert Pinsky said yesterday, I felt that there is a better example of Apollo somewhere. In his introductory Stanford workshop on "The Occasions of Poetry", Pinsky cited Yeats' Sailing to Byzantium: "There is no singing school, but study monuments for their magnificience." When none in the class responded to the meaning of this line, Pinsky said "When you wish to do anything well, study things that are monumental!" So I ask myself what is the best artistic representation of Apollo, the Greek Sun God? Not De Chirico's painting of Apollo in his Love Song, but the stature of Apollo Belvedere in the Vatican Museum. I recall how this sculpture had influenced my favorite poet Goethe, whom I had taken on as a spiritual mentor in my college days. I'm typing what Goethe wrote about the Apollo Belvedere from his Italian Journey, written when he was 37. There is much to learn from Goethe's insights on art and life. It is my firm belief that the monumental works of art which Goethe experienced in Italy such as Michelangelo's Sistine Ceiling and the Apollo Belvedere inspired and shaped his mind to become a monumental poet and a universal genius. Till now the weather has followed a six-day cycle two cloudless days, one overcast day, two or three wet days and then again fine weather. I try to make best use I can of each one of them. The noble objects with which I am surrounded never lose their freshness for me. I did not grow up with them. I have not wrung from each its peculiar secret. Some attract me so powerfully that, for a while, I become indifferent, even unjust, to fully that, for a while, I become indifferent, even unjust, to others. For example, the Pantheon, the Apollo Belvedere, one or two colossal heads and, recently, the Sistine Chapel have so obsessed me that I see almost nothing else. But how can we, petty as we are and accustomed to pettiness, ever become equal to such noble perfection? Even when one has adjusted oneself to some degree, a tremendous mass of new things crowd in on one, facing one at every step, each demanding the tribute of one's attention. How is one to find one's way through? Only by patiently allowing it all to grow slowly inside one, and by industriously studying what others have written for one's benefit. I immediately bought the new edition of Winckelmann's History of the Art of Antiquity, translated by Fea. Read on the spot where it was written and with an able and learned company to consult, I find it a great help. I am now starting to look at the best things for the second time. As my initial amazement changes to a feeling of familiarity, acquire a clearer sense of their value. For a profound understanding of what man has created, the soul must firs have won its complete freedom. Marble is an extraordinary material. Because of it, the Apollo Belvedere gives such unbounded pleasure. The bloom of eternal youth which the original statue possesses is lost in even the best plaster cast. In the Palazzo Rondanini opposite, there is an over-lifesize mask of a Medusa in which the fearful rigidity of death is admirably portrayed. I own a good cast of it, but nothing is left of the magic of the original. The yellowish stone, which is almost the colour of flesh has a noble, translucent quality. By comparison, plaster always looks chalky and dead. And yet, what a joy it is to enter a caster's workshop and watch the exquisite limbs of the statues coming out of the moulds one after the other. It gives one a completely fresh view of the figures. All the statues which are scattered over Rome can here be seen set side by side. This is invaluable for purposes of comparison. I could not resist buying the cast of a colossal head of Jupiter. It now stands in a good light facing my bed, so that I can say prayers to him the first thing in the morning. However, for all his majesty and dignity, he has been the cause of a comic incident. When our old landlady comes in to make our beds, she is usually accompanied by her favourite cat. I was sitting outside in the hall and heard her busying herself in my room. Suddenly she flung the door open to hurry is not like her and called to me to come quickly and witness a miracle. When I asked her what had happened, she replied that her cat was worshipping God the Father. She had noticed for some time that the creature had the intelligence of a Christian, but, even so, this was a miracle. I ran into the room to see for myself, and it really was miraculous. The bust stands on a high pedestal, and the body is cut off far below the chest, so that the head is near the ceiling. The cat had jumped up on a high pedestal, placed its paws on the chest of the God and stretched itself up until its muzzle could just reach the sacred beard, which it was now gracefully licking, oblivious of the exclamations of the landlady or my entrance. I have had plenty of time here to discover two of my capital faults, which have pursued and tormented me all my life. One is that I could never be bothered to learn the mechanical part of anything I wanted to work on or should have worked on. That is why, though I have plenty of natural ability, I have accomplished so little. Either I tried to master it by sheer force of intellect, in which case my success or failure was a matter of chance, or, if I wanted to do something really well and with proper deliberation, I had misgivings and could not finish it. My other fault, which is closely related to the first, is that I have never been prepared to devote as much time to any piece of work as it required. I possess the fortunate gift of being able to think of many things and see their connections in a short time, but, in consequence, the detailed execution of a work, step by step, irritates and bores me. Now it is high time for me to mend my ways. I am in the land of the Arts; let me study them really thoroughly, so that I may find peace and joy for the rest of my life and be able to go on to something else. Rome is a marvelous place. One finds here not only objects of every kind, but also people of every kind who take their work seriously and know exactly what they are doing, and one makes rapid and easy progress in their company. I am beginning, thank God, to be able to learn from others and profit from their experience. And so, I feel better than ever in body and soul. I hope you will remark this in my productions and approve of my absence. I am united with you by what I write and think; otherwise I am very much alone, and in company keep my thoughts to myself; but this is easier here than anywhere else because there are always enough interesting topics for conversation. 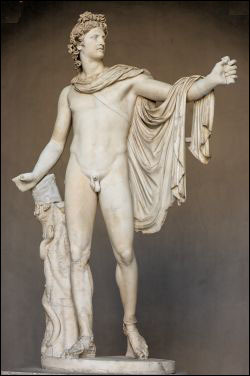 One evening the Apollo Belvedere, that inexhaustible topic of artistic conversation, cropped up in our discussions. Somebody remarked that his ears were not really very well done, and this led us naturally to talk about the dignity and beauty of this organ, the difficulty of finding a beautiful one in Nature and of reproducing it adequately in Art. Hofrat Reiffenstein started reciting the lecture he was never tired of repeating, namely, that one should not begin by looking at the best; one should start with the Carracci in the Farnese Gallery, then move on to Raphael and only after that draw the Apollo Belvedere and go on drawing him till one knew him by heart, as the ultimate beauty beyond which there was nothing to desire or hope for.